DU CANN, Sir Edward (1924-2017). Sir Edward du Cann was born in Beckenham, 28 May 1924 to a political family: his father had been a parliamentary candidate and other relatives had been MPs. He was educated at Woodbridge School before reading Law at St John’s College, Oxford. 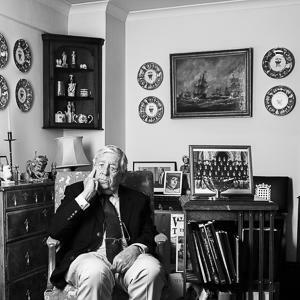 The Second World War interrupted a career in banking, when he served as an officer in the Navy. In 1951 he entered Conservative politics, contesting Walthamstow West against Prime Minster Clement Attlee in 1951. He was first elected in a by-election in 1956 for Taunton. He served in junior ministerial posts in the Treasury and Board of Trade, before becoming Chairman of the Conservative Party 1965-67, and the long-running Chair of the backbench 1922 Committee, holding the post between 1972 and 1984. During his tenure he played a crucial role in the election of Margaret Thatcher as party leader. He was made a Privy Councillor in 1964, and became Chair of the Public Accounts Committee between 1974 and 1979. In 1962 he first married Sally Innes, with whom he had three children, and after retirement in 1987 he married again in 1990 to Jennifer Evelyn. Sir Edward passed away in August 2017. Click here to listen to the full interview with Sir Edward du Cann in the British Library. When I was chairman of the 1922 committee for instance, which I did for 12 years, longer than anybody has ever done it, I was elected I think 15 times as Chairman. It comes and it goes, I’m not sure it’s quite as powerful today as it has been. There was one outstanding example of its power and authority, and I would go further and say its duty, when it represented to Mr Heath that he probably no longer enjoyed the confidence of the Conservative party and that he ought to either resign or stand for election as leader. The result was, very sadly for him, that he was defeated in an election by Mrs Thatcher. I was asked to consider [standing as leader] – I received a letter written by the MP for Surbiton, Nigel Fisher, signed by 25 Conservative MPs, and they asked me to put myself forward. Well I considered it and the situation and decided not to. There were a number of reasons: Margaret Thatcher was emerging, I thought that she would perhaps be a better candidate. I always thought it would be very good for the Tory party, which had elected the first MP of the Jewish faith, I thought that it would be very good if the Tory party was the first party to have a woman leader and a woman Prime Minister. Those were two of the reasons. My wife was rather against my standing as leader also I must say. Describes family life. Born in Beckenham; father a Barrister at Gray’s Inn, mother had been a pharmacist. Remembers grandfather’s house. 02.15 Father had twice been parliamentary candidate for East End seats before Du Cann was born; political tradition in family –great great uncle had been MP for West Country seat in C19th. Talked about politics at home- economic situation. 04.15 Education started at Roman Catholic school (not a Catholic himself). Parents divorced in 1933. Went to Grammar school at Woodbridge, Suffolk. 05.15 Father read Morning Post newspaper. 06.00 Went on to study Law. Had used to accompany his father to Court –thought Law most honourable profession. His younger brother became a senior lawyer. He himself never went to the Bar. 07.25. Wartime. Talks of military training in OTC at school. Accepted for Oxford at 16 and waited to be called up. Did enough terms to qualify for wartime degree. Served in Royal Navy as Ordinary Sailor, then Able Seaman, then commissioned at time of D-Day. Served on Motor Torpedo Boats in Coastal Command –busy time. 11.15 Politics came up occasionally for discussion whilst in Navy. Met AP Herbert. Had an interest in politics. 12.40 The war affected his whole outlook on life. Sense of team loyalty in Navy affected his political outlook. Went back to Oxford briefly after the war but wanted to earn a living –decided against going to the Bar. 15.14 Started working for a war-damaged hotel in the City, then a group of Investment Trusts –learned the business and enjoyed it. Essential for a subsequent career in politics. Earning a living gave him essential independence as an MP later. 18.40 Post-War change –sympathised with efforts to change society, albeit disagreed with way NHS was introduced. Describes how Conservative candidates post-war were impatient –Nationalisation programme was a failure –their motive was to do something about it. 21.35 Describes his own political viewpoint –more practical than doctrinaire. Admired Churchill greatly. Astounded that he’d been turned out in 1945. Politics has always been a practical thing for him. 23.45 First political experience was in his Sussex village standing for Parish Council –believes in getting people involved (feels Cameron should have done more of this despite talk of “Big Society”). Anecdote about running the local cricket pitch. 25.45 Talks about getting selected for the first time. Wrote to West Walthamstow constituency asking them to consider him as candidate (it was Attlee’s seat). A good apprenticeship. Attlee a generous opponent –learned that you can disagree with someone and still share the same objectives. 28.40 Today society has changed –people in Parliament who are interested more in themselves than in the general good. 29.40 Stood for Barrow seat. His employers had told him that his political activities were not welcome, so he had “retired” from politics. But at 1955 election he was encouraged to stand again –only two seats were available –one of them Barrow. Describes the constituency –dominated by a single industry –shipbuilding. Became a believer in diversification. 32.35 Taunton by election 1956 –“rough”. Prime Minister Eden was unpopular; had “sacked” popular local MP over gaffe in Parliament over Cyprus. Fought three-week campaign; Cyprus was the main issue. Won with majority of 600 (the previous majority had been 5000). 37.00 Describes the count. He’d arranged a secret “code” with the agent to communicate how the count was going. Held the seat until 1987 –last election he won a majority of 12,000– felt he was trusted there. 41.55 Arrival in Westminster –“Madhouse”. Tells story of being presented to the House and taking the Oath; encounter with the Chief Whip. Most Tory whips were ex-service people who imposed a military discipline. 45.35 Wasn’t ambitious –content to achieve things at local level. Carried on his career outside -had mornings free. Easier to do then. Later the two worlds came into conflict. 46.50 Describes work in the House. Became Secretary for various groups and committees. Committees were important –safety valves for opinion, forums for discussion and developing policy and as a check on Ministers. 48.10 Describes work of Select Committees –a more effective means of questioning the Executive than questions in the Chamber. Was Chairman of Public Accounts Committee. Very much involved in introducing wider range of Select Committees into the work of the House. Feels they had been doing reasonably well but more recently party interest has started to be stronger. 52.10 Describes role as Chairman of Conservative Party –appointed by Alec Home. Du Cann had been Minister of State at Dept of Trade under Heath and had steered through an unpopular bill abolishing Resale Price Maintenance –Home thought he could cope with an awkward party. Loved the role and believed they laid the foundations for Heath’s subsequent success. 54.00 Speaks of being Chair of 1922 Committee and successively re-elected. (refers back to the question of whether it was easy to keep two careers in parallel). Held many positions and never had a difficulty until a “coterie” of Tory members decided to displace him from 1922 Committee. 55.35 Describes the role of 1922 Committee –not as powerful today since present PM has tried to emasculate it. It represents the Backbenchers and can put their views forcibly. It has made and ended careers –e.g. told Heath he had to resign or stand for leader. He was himself asked to consider standing as leader; decided not to -Thatcher was emerging, and his wife was against it. 58.55 Interview terminated because of loud road works beginning outside. Interview begins some hours later on the same day in the same venue. Interviewer Mike Greenwood. 00.20 Recalls his maiden speech on Budget in 1956 arguing against vouchers for Pensioners to buy tobacco. Not a natural speaker. Listened to a lot of speeches in Chamber; admired Michael Foot’s oratory. Nye Bevan was a disappointing speaker. 2.25 His immediate contemporaries had come into Parliament in 1955. He was only 31. Mentions names of some of his friends and contemporaries –e.g. Humphrey Atkins, Peter Rawlinson–an irreverent little group. Importance of political friendships. Became chairman of Burke Club facilitating links between lobby correspondents and junior MPs. Still a member of club “No Aims or any sort of ambition”. 04.40 Difference between party then and know – more people who think they should be running things today then those content to be “regimental officers”. 05.40 Problematic relationship with Heath although they did work together. Talks of Heath’s “streak of jealousy”. 06.48 Talks of being involved in efforts to challenge Heath’s leadership when Chairman of 1922 Committee. Had to tell Heath about how the party was feeling about him after the first election in 1974. 09.45 Talks about “Milk Street Mafia” and their role in plotting against Heath. He issued a writ against use of the term. 11.35 Describes calculation made when considering ousting a leader –need to keep party together and avoid public fighting; need to find a leader who was generally acceptable. Impressions of Thatcher (who supplanted Heath). Had known her a long time. Attracted by her staunchness. He knew and respected Dennis Thatcher too. Pleased that the Tory party was the first to support a woman as Prime Minister. Knew she would have difficulty bringing party with her –his service was to keep the Tory party behind Thatcher as she settled in whilst in Opposition, despite factionalism. 15.25 Comparison with Spin Doctors today –unnatural reliance under Cameron; doesn’t approve of it. Describes flow of contradictory statements –PMs better seen than heard too often. 17.30 Changes to role of Backbencher – Select Committees now offer alternative career path to being in Government. Power of Whips has been reduced –beneficial. In his day, party committees worked as a safety valve e.g. the subject-focused committees that lay beneath the 1922 Committee. Nowadays minds are made up by Number 10. 20.25 Relationship with Thatcher as PM –excellent and friendly. Insisted on being seen by her immediately if there was a need. She listened to him-warning her was an important role. Refers to her lack of politeness to senior colleagues –he didn’t suffer from this because he wasn’t beholden to her. 22.45 Had heavy commercial responsibilities outside Parliament –wasn’t surprised therefore not to be offered a senior role. Proud of his role on 1922 Committee. 24.08 Talks about successes and difficult moments in his business career. An advocate of popular share ownership- believes he started a revolution in people’s savings habits. He was Chairman of a Merchant Bank that got into difficulties (Keyser Ullman). Gives background to it –a property boom followed by a crash. 27.40 Damaging effect on personal reputation –one of the problems with being an MP and also earning a living. In the commercial world you run risks and things can go wrong. You can face the world if things go wrong because of misjudgement rather than dishonesty. 29.30 Speculates on what his career might have been without the business failures. Feels on the whole he was lucky. 30.10 Describes end of political career –personal difficulties (wife had left him) – security problems too (two friends had been killed by IRA –Ian Gow and Airey Neave). He would be 67 at next Election, decided to stand down. 32.15 Would have liked a career in the Lords but he had got into commercial trouble –describes “confidence trick” played on Prime Minster by Mohammed Al Fayed over Harrods take-over. Describes his involvement with Lonrho, their work in Africa (and the risks they ran) and their attempt to take over Harrods –turned down by Monopolies Commission. Thatcher was led to believe that Sultan of Brunei was involved in purchase, but it was really Al Fayed. Lonrho took legal action against Dept of Trade. Describes his involvement in Housing company that went under. Dept of Trade brought action disbarring former Directors, so he had to resign from Lonrho as well. Lost his income –had borrowed money for his estate in Somerset which was now repossessed. Eventually Govnt withdrew case but damage had been done. 40.35 We’ve developed a posse of professional politicians today –disapproves. It’s important to bring in experience from outside. 42.15 Unhappy that Parliament is held in such low esteem today. Democracy belongs in every household. 43.45 Reliance of politicians today on the public purse –problems associated with that. 44.50 Slightly pessimistic about politics today –no one is trying to rectify the problems. There’s a duty to defend democracy. 45.35 Would do it all over again –despite the problems he’s had. Just marked the 90th anniversary of the 1922 Committee. 46.39 RECORDING ENDS PREMATURALY BEFORE CONCLUSION OF FINAL ANSWER.